'Dinghy, type K'. Stores reference 27C/1927. Introduced in January 1942 this is the classic wartime one-man dinghy intended for emergency use. Manufactured in rubberised cotton in the form of a boat-shaped inflation chamber with a proofed cotton cape and hood at the rear end and a flexible apron or spray shield at the front. This provided the airman with some protection from sea-spray and the elements when in use. These were permanently attached and could be unrolled and fastened to the sides using small straps and 'D' rings around the top of the float chamber. In addition the dinghy has a water pocket on the underside to aid stability, an integral sleeve to hold the CO2 gas inflation cylinder and a top-up valve to which a hand operated concertina type inflation bellows could be attached. Specially moulded housings on either side of the dinghy allow the insertion of an extendable wooden 'thwart' into which the base of the 7-section aluminium mast could be fitted. This was used in conjuction with a red glazed cotton sail in the form of an isosceles triangle printed with sailing instructions. The sail was fitted with simple rope 'steerling lines'. The type K was carried folded and compressed within a variety of different packs used in conjuction with the airman's parachute equipment. These packs had internal stowage pockets to house the various accessories that were not normally carried within the dinghy itself. The choice of pack (and therefore accessories) depended on the type of parachute worn by the airman and/or the type of aircraft being flown. This dinghy is in very good overall condition. The fabric is quite clean and very supple, including the majority of the normally perished and hard spray shields. It is printed with user instructions in several languages and retains all the original straps & D-rings, bellows strap (and Mk.II inflation bellows), CO2 cylinder sleeve and so on. The bouyancy chamber inflates and will hold air/shape for a few hours although this does leak out gradually. Left overnight it wasn't completely flat. There may be a small hole or perhaps a seam or valve leak? A rare opportunity to obtain a very good dinghy. 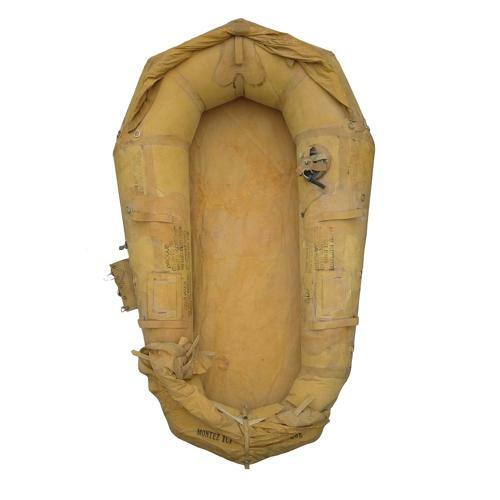 We are also selling other dinghy related items separately so do check those out too. More photos on request. Stock code S23010.